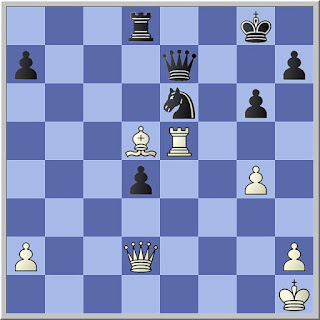 Last week's Friday chess puzzle from Van Scheltinga vs Stahlberg, Amsterdam 1950, generated a lot of interest. 3 Qg2 Qb1+; 4 Qg1 Qe4+; 5 Qg2 Qxg2+; 6 Kxg2 Nf4+ winning the rook, and Black emerges a piece up. Congratulations to Paul Devisser, Chris Wardle, and 'averageplayer', amongst others.